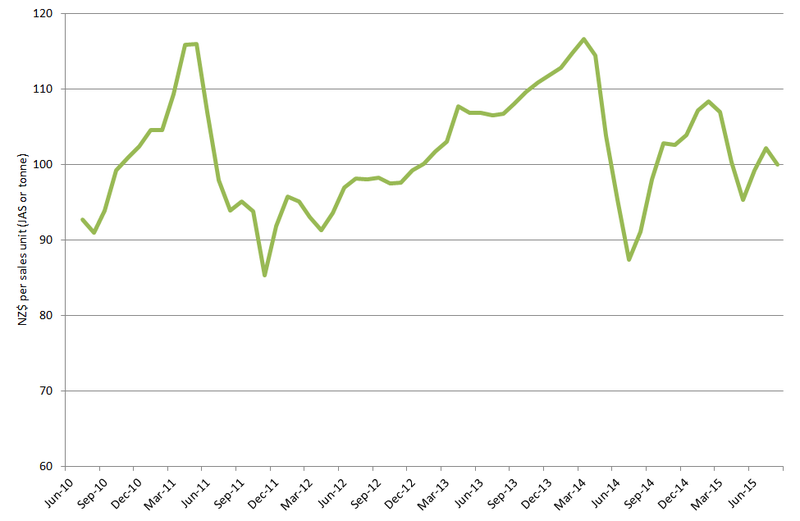 This month export log market weakness replaces nascent recovery. Optimism of a continuation of reducing log inventories and firming prices in China has given way to stubbornly high log stocks, price weakness and muted demand. Domestic log demand is generally strong with some regions short of key log grades and some mills having to reduce operating hours to match log supply. This isn't so much because the logs are being exported, but rather that overall harvesting production is down. Sentiment about the Chinese economy in general and the log market in particular has deteriorated since last month. Recent Chinese international trade figures show exports declined 8.3% (US$ terms), despite a modest expansion in world trade. This apparent loss in market share foreshadows the loss of a major support for Chinese economic growth and represents a considerable economic constraint if the start of a trend. The stronger Chinese trade weighted exchange rate and loss of low value-added/labour intensive capacity (both of which make exports less competitive) are expected to be ongoing and continue to constrain export growth. On the Chinese housing market, Westpac reports " We retain the basis position that the market bottomed around September 2014, but the recovery trajectory will be very timid. The timidity of the rebound outside of the tier-1 (mainly coastal) cities speaks eloquently to the various challenges confronting both the demand and supply sides of the market." Whilst all tier-1 cities are experiencing steady house price growth (all markets), across the 70 cities monitored, the secondary market (used homes) increased in price in June in 42 cities, declined in 19 and stayed the same in 9. Across these same 70 cities in the new house market (same period) 30 rose in price, 32 declined in price and 8 stayed the same. So whilst the proportion of cities with price increases has been rising steadily since the market bottom last year, the net number of cities experiencing price increases has only recently exceeded those experiencing declines. Of more importance to the log market, and NZ log suppliers, new housing starts are lagging considerably. Westpac figures show a continuing declining trend in new housing starts since the beginning of last year. Until this convincingly changes to an uptrend, the log market will be susceptible to becoming overstocked by excess log supply, and price weakness. The volatile and plunging Chinese share market has had a lot of media coverage, as has the Chinese governments interventions to prop up the market. Whilst such interventions seem somewhat fruitless and a disturbing example of how pervasive the Chinese government can be, the net impact of share prices in China on the broader economy is considerably lower than most western markets. For example, the USA's share market capitalisation represents about 140% of its gross domestic product (GDP) in comparison to 50% in China. China's economy is still dominated by unlisted state-owned enterprises (which presents its own, but different, challenges regarding the economy), and share ownership is still confined to a minority of the more wealthy people. On a more positive note, investment manager Platinum reports that despite worrying excessive lending by banks in China and high debt levels, the hitherto super-hot housing market is little threat to balance sheets. It notes that some 40% of overall [housing] transaction volume is represented by the 10 top mega-cities of China and these cities have experienced both the smallest falls in price and the fastest recovery in prices. It further estimates that the residential loan-to-value ratios across the whole country are under 50%. In an effort to provide more stimulus to the economy it was recently reported that some of the major Chinese government agencies are to merge to create super-agencies that will invest in a range of projects including major construction works. It is also believed the government will slash lending rates further to try and boost economic growth. These initiatives will be good news for NZ log exporters, but the trickle-down may continue to be slow. 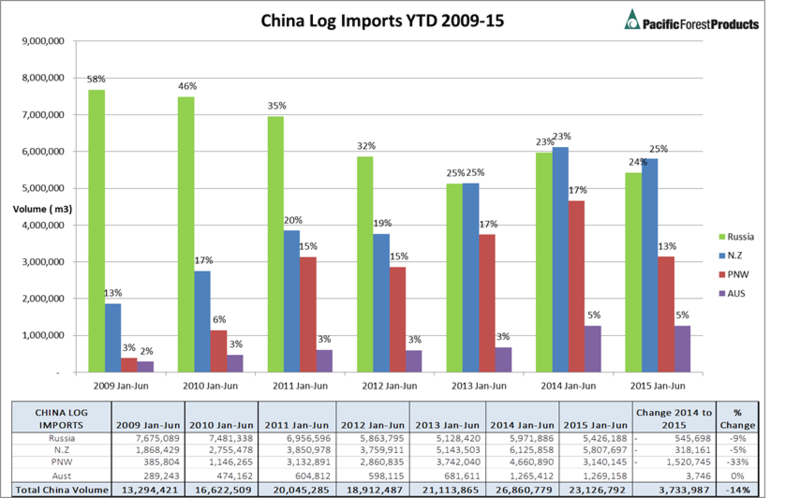 The first half of 2015 has seen a 3.7 million cubic metre reduction in Chinese log imports from the main supplying countries, compared to the same period last year (see chart). The very price sensitive North American (PNW) supply has fallen the most (33%). So far, however, Chinese demand has dropped commensurately as sluggish new housing starts combines with the current harvest season which always sees a drop in house construction activity. The market is still looking for total log inventory in China to drop 1-2 million cubic metres prior to any sustained price recovery. The Indian, Korean and Japanese markets have been relatively strong for several months and have attracted increased log supply. This has provided a useful diversion of volume away from over-supplied China. In the case of India, in particular, limited and inefficient discharge ports and internal log transport infrastructure make this market very vulnerable to over-supply. As one large NZ log trader recently put it, with an armada of ships heading to India we are wary of what will happen from September onwards. Ocean freight rates have been stable. A slight increase in charter rates has been offset by falling bunker (log vessel fuel oil) prices. The US$/NZ$ cross rate fell from 0.68 at the start of July to 0.66 at the start of August, providing a small positive offset to falling in-market prices in China. Momentum of what was broadly seen as a up-trend in the market has shaken confidence and had a negative impact on sentiment. As is usual in this kind of market environment, there is more polarisation in outlook than usual and it would be prudent to include a scenario of weak export log prices for the rest of the year in planning and decision-making. The more optimistic view is that steeply falling log supply will combine with reasonable Chinese demand and as log stocks fall in China, CFR price will rise. Many commentators are also forecasting a depreciating Kiwi dollar as the year progresses, which will support at wharf gate prices. Longer term, the overall state and growth rate of Chinese economy will continue to be a big driver of the fortunes of New Zealand forest owners harvesting their forests. Fonterra's recently announced reduction in forecast milk pay-out to $3.85 for the 2015/16 will weigh heavily on the dairy sector and the economy at large. Fonterra is trying to soften the blow to its shareholding farmers by signalling strong dividend flows from the company and up to an additional $0.50/kg pay-out in the form of an interest-free loan. Nonetheless, the vastly reduced revenues will shake the industry and slow overall consumption growth of the New Zealand economy. The offset for the economy is increased activity in non-dairy exports boosted by the lower Kiwi dollar and booming tourism. In addition, the housing market, already leaping ahead in Auckland is getting fed by falling mortgage interest rates. These are more likely to fall further or at least stay low as the government focusses more on avoiding an economic recession and less worrying about fuelling a rampant (Auckland) property market. Unpruned log prices have fallen marginally in some areas, but remained strong in most. Some regions report working with log buyers to change log specifications to increase the yield of logs with sought after properties. The pruned domestic pruned log market remains strong. Since stumpage (the net return to the forest owner after deducting costs from log sales revenue) is a composite of all log grades being marketed from a harvesting job, the relative strength of the domestic log market and pruned log export market is masking the impact of the weak unpruned log export market. This, however, is only the case for forest owners with access to these markets. In some regions, such as Gisborne/East Coast and Wellington/Southern North Island, few domestic options means much greater exposure to more volatile export returns. It is these forest owners who will have the toughest decisions to make about commencing or continuing with harvesting. The PF Olsen log price index fell two points from $102 last month to $100 this month. It is now $15 higher than its cyclical low of $85 in November 2011 and $6 below the two-year average and $1 below the five-year average.